Dr. Webster received his D.D.S. degree from the UT dental school in Houston, where he graduated in the top 5% of his class and was inducted into the Omicron Kappa Upsilon National Dental Honors Society. While in dental school, he received many other awards and scholarships including the American Academy of Cosmetic Dentistry Award for Excellence in Cosmetic Dentistry. In order to provide excellent service and care to his patients, Dr. Webster has continued to expand his knowledge of dentistry through continuing education and keep up with new technologies. He is a member of the Seattle Study Club, a worldwide network of study clubs whose members believe in cultivating excellence in continuing education and strive to provide the highest standard of care for the patients that rely on them. Dr. Webster has also completed an Implant Surgery and Restoration Clinical Residency at the McGarry Implant Institute, facilitating Dr. Webster to place and restore dental implants. 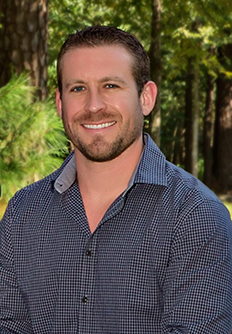 Prior to pursing his dental education, Dr. Webster attended Trinity University in San Antonio, receiving a Bachelor of Science Degree in Biology and Biochemistry. His passion for science and research lead him to institutions ranging from the Marine Biological Laboratory in Woods Hole to MD Anderson Cancer Center in Houston. While performing research at MD Anderson, Dr. Webster participated in the publication of several journal articles pertaining to bone cancer. In dentistry, Dr. Webster continues to remain active in research and development as a member of the Journal Editorial Advisory Board for the Greater Houston Dental Society Journal. Dr. Webster and his wife Jennifer, a Kingwood native, have been blessed with three beautiful girls, Abby, Kenley, and Lila.